How do you determine your tithe? Some Christians tithe ten percent of their full income. Others may tithe a portion after paying their bills. Still others give based on what they believe the church “needs.” Regardless of the criteria, human standards judge one’s level of generosity based on the amount given. The bigger the gift, the more generous the giver. This was not the case with Jesus’ appreciation of those who placed their gifts into the temple treasury. He praised the poor widow who had only given a fraction of a penny, saying to his disciples that she had given more than all others because she gave all she had to live on. Unlike human standards, God’s standards focus on the disposition of the heart that gives. 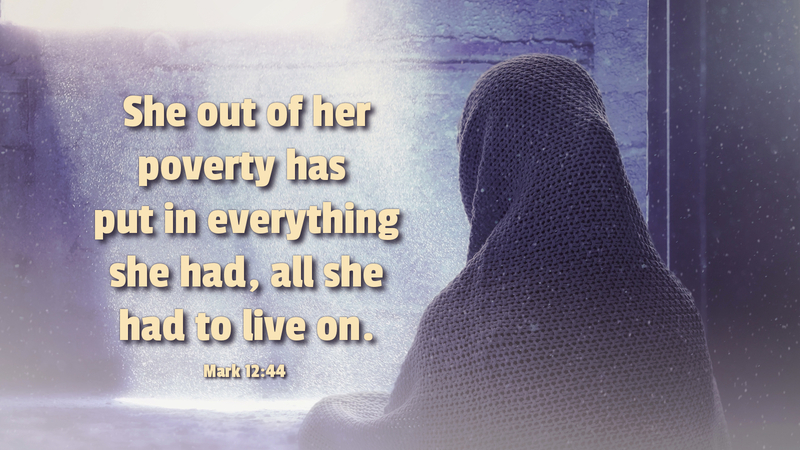 In a society where widows depended on the generosity of others to meet their basic needs, this poor widow gave all she had, trusting that God would provide. Like the Lord Jesus Christ, who would give his very life to redeem the world from eternal damnation, the poor widow gave all she had to live on, thereby showing absolute trust in God to provide. She withheld nothing from God; she gave her all to Him. Prayer: Heavenly Father, grant me to trust you and offer to you all I am and have. Amen. Pastor, your words are well spoken. The disposition of the giver’s heart is the valid point. When Cain and Abel were presenting their offerings, Cain’s heart was what was at fault, whereas, Abel was a cheerful giver as he knew it was the Lord who provides. Cain gave grudgingly, not joyfully.